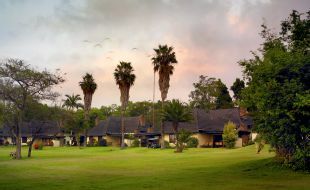 Stay in comfort surrounded by nature at the family-friendly Sabi River Sun hotel resort in Hazyview. The newly refurbished Sabi River Sun Resort is gracefully situated along the banks of the peaceful Sabie River, surrounded by lush bushveld. Enjoy an authentic African experience coupled with the comforts of a luxury laid-back resort. The resort is equipped with a total of 532 beds in 60 hotel rooms and 104 timeshare chalets and offers an abundance of activities for the whole family to enjoy. With five swimming pools, a hippo and crocodile dam, golf courses, mountain biking trails and plenty of opportunities for relaxed bush hikes, Sabi River Sun is a family favourite. With views out to the stunning plains of the Mpumalanga Lowveld and the Sabie Valley, the town is renowned for its spectacular panoramas. In the heat of summer, the low shimmering haze that settles on the town captures the essence of its name. Hazyview is the perfect destination for a true African adventure. Visit the Shangaan people in their traditional villages that sit in the shade of ancient African chestnut trees in the forest reserve. Go for an exciting safari in the world-class game reserve, the Kruger National Park and get the chance to see the Big Five. Take a look through God’s Window into the lush forest clad ravine of the Blyde River Canyon. About five kilometres out of the small town of Hazyview, you can get the chance to meet the Shangaan people in a traditional setting. This hospitable people invite you to visit their homes and learn about their culture and customs. Popular with tourists from around the world, you will just need to travel 14 kilometres to the Phabeni Gate from your base in Hazyview. Relax and enjoy observing the beauty of African wildlife. About 55 minutes from Hazyview, there is a small town that is a protected heritage site. This unique town offers its guests a fascinating chance to peer into the past and rediscover the gold rush. Drive for about an hour and a half along a scenic road and you can find this awe-inspiring reserve that is said to be the largest ‘green canyon’ in the world. Here is where you can go along the Panorama route and visit God’s Window, the Pinnacle and Bourke’s Luck Potholes. For an intimate encounter with these giants of nature, be sure to visit the Elephant Sanctuary. Here you can interact with the elephants and even have the unforgettable experience of an elephant back ride!